" One of the things I'm most proud of is that people say to me what Simple Minds are you talking about? The avant-garde, the art-rock, the pop, the ambient, the instrumental group, the political, the folk, the stadium band? We've been on one hell of a journey. To play all those different styles but at the same time be quintessentially Simple Minds is an amazing thing. " - Jim Kerr. As the ten year cycle repeated, starting with Celebration (1982), Glittering Prize 81/92 (1992) and The Best Of (2001), it was considered time to release another retrospective. The band's re-emergence with Neon Lights, Cry, Black And White 050505 and Graffiti Soul plus the success of X5 and 5X5 Live ensured that the compilation would not only concentrate on the early years, but would be packed full of new material from the last decade. 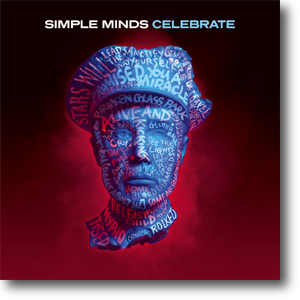 The compilation would also coincide with the The Greatest Hits+ tour which saw Simple Minds undertaking an extensive tour of small UK venues. 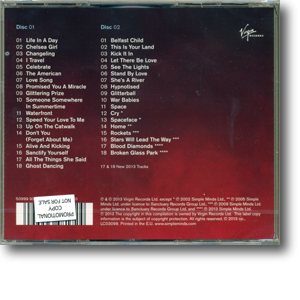 Virgin were more confident after the success of X5 and 5X5 Live and decided to release a 2CD double jewelcase and 3CD boxset. (The original plan, the unreleased Greatest Hits +, was only going to be released as a 1CD and 3CD package). It was decided to issue the edits and single mixes of the songs. This finally tidied up the discography and many of the early songs appeared in shortened form on CD for the first time. This thinking extended to the "lost" singles from Our Secrets Are The Same where the Gary Wilkinson single mix of Space and the Phil Bodger single mix of Jeweller To The Stars were released for the first time. Other firsts included the new songs Blood Diamonds and the airplay-only single Broken Glass Park. Broken Glass Park was premiered on BBC Radio 2 on Ken Bruce's morning show on the 11th February 2013. For each subsequent week, it became Ken Bruce's Record of The Week and then climbed to the 'B' list and finally the 'A' list. Billy Sloan picked up the other 'firsts' when he exclusively played Blood Diamonds on his show of the 17th February and then followed the next week with the first play of the reworked Space. The artwork was based on the statue of the RFC officer (Royal Flying Corps) pictured on the front of Empires And Dance. It wasn't possible to identify the statue - despite many enquiries - and so a 3D computer generated model was constructed and then graffitied digitally. The early forms of the artwork had song lyrics on the statue's face but it was felt that the song titles were more identifiable so it was changed. Some of the early versions of this artwork ended up on some tour posters. All main phases of the band's career were included in the montage in the CD booklets. Many rare, different or alternative shots were sourced so the package would appeal to both old and new fans. Andy Earl was contacted and found an alternative shot of the Neapolis sleeve. The pictures on the wallets of the 3CD box-set were rare shots of each phase of the band from that period. 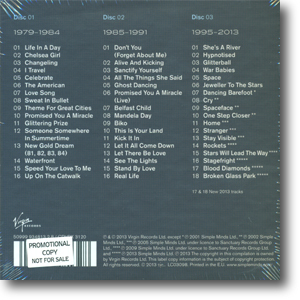 Virgin first issued promos of the 3CD set, with the CDs housed in colourful custom sleeves. The 2CD sets followed some weeks later and shared similar colourful custom artwork. Both sets were extremely rare. The album was released on the 25th March 2013 in two formats. The 2CD set featured 2 CDs in a jewelcase with a booklet, whilst the 3CD set was housed in a chunky box with booklet, 3 CDs in picture wallet sleeves and a double-sided poster of the statue and the singles discography. Both featured stickers on the cellophane on the front which were, unfortunately, lost when the package was opened. The 2CD set was intented for record shops, supermarkets and shop where it would fit on the shelves easier. 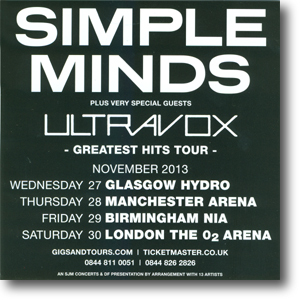 Both formats also contained single-sided flyers for the forthcoming arena tour with Ultravox. The album was Radio Two's Album Of The Week for the week commencing the 30th March 2013. Broken Glass Park was on the 'A' list during the same period. A single CD version was prepared for the north American and Canadian markets. This was released in late April.